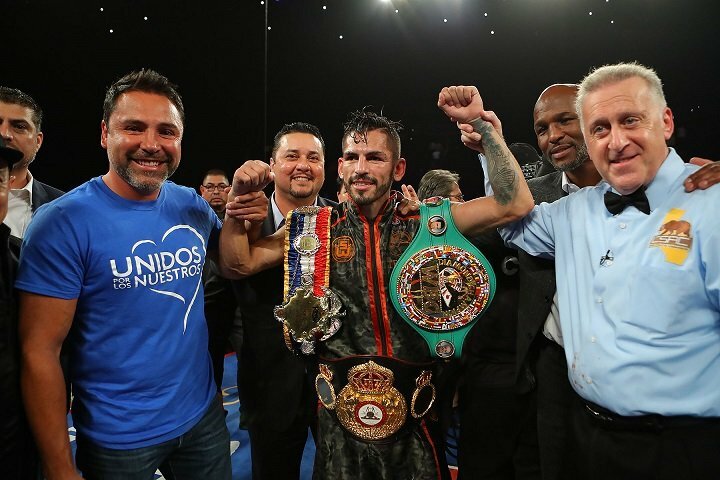 Jorge “El Niño de Oro” Linares (43-3, 27 KOs) successfully defended his WBA, WBC Diamond and Ring Magazine Lightweight Titles with a split decision victory against the English southpaw “Cool Hand” Luke Campbell (17-2, 14 KOs) at Los Angeles’ “Fabulous” Forum. Linares dropped Campbell in the second round with a hard right hand and engaged in explosive exchanges in each round to win with scores of 115-112 and 114-113, while one judge scored the fight 115-113 for Campbell. Ring Magazine Lightweight World Championships, held on Saturday, September 23 at the ‘Fabulous’ Forum in Inglewood, California. The championship event was presented by Golden Boy Promotions and Matchroom Boxing, in association with Teiken Promotions. The event was sponsored by Tecate, BORN BOLD, Casa Mexico Tequila, Thor: Ragnarok and Fred Loya Insurance and was televised live on HBO World Championship Boxing® at 10:00 p.m. ET/PT.